Demand for wind turbines has been increasing, due to the rise in the number of wind turbine installations across the world. It permits the positioning of one part with respect to another in such a way that relative movement is possible, coming into play in different parts of the turbine. Wind turbine bearings are intended to withstand extraordinary temperatures, load fluctuations, support access, and grease enhancement. Developments and improvement in the field of wind power generation, vast number of wind installation projects, and rise in demand for effective wind turbine component are driving the wind turbine bearings market. The demand for electricity is growing the region, and increased focus on development of renewable power would drive the wind power installations in North America. 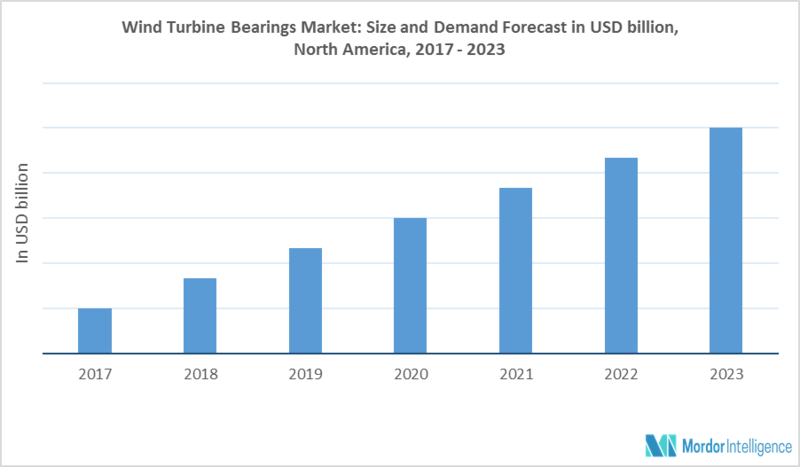 The other factors, such as adoption of Industrial Internet of things based smart bearings, increment in government activities and policies worldwide to support installation of wind turbines, increment in application of high capacity bearing in wind turbines, rise in energy consumption, will propel the demand for the wind turbines bearings market, during the forecast period. Policy Level Support to Drive the Wind Power Sector. The policy level initiatives in the North American region is the major stimulant to wind power development. In the United States, the extension of the production tax credit (PTC) for four years is likely to create a 40 gigawatt wind energy market between 2017 and 2020. In Canada, the ambitious renewable procurement programs are expected to drive the installation of wind power by the end of 2019, in Western Canadian provinces Alberta and Saskatchewan. Such strategic initiatives are likely to promulgate the market for wind turbine bearings in North America, in near future. Wind power capacity in the United States endured strong growth in 2017. It saw 7GW of wind projects installed in 2017, representing USD 11 billion in new investment. Now the total installed capacity in the United States is more than 89 GW. Additionally, it added its first commercial offshore wind farm in 2016. The support from federal and state governments, combined with acknowledgement and demand from buyers, has advanced development in the wind energy industry over the past few years. Also, the developing focus on the organization of both onshore and offshore wind farms in the United States is anticipated to strengthen the demand for wind turbines. March 2018: GE installed the 1st offshore wind turbine at Merkur Windfarm in Germany. Major Players: Kaydon, SKF, Laulagun Bearings , URB group, The Timken Company, NSK Ltd, NTN Bearing, Rollix, Koyo, Schaeffler Group, among others.